Christians grow the most when their lives revolve around Jesus Christ. We could call this a “Christocentric lifestyle.” This means that every moment of your life has some connection to our Lord and Savior. Although the apostle Paul didn’t use the term “Christocentric lifestyle,” the concept is present when he told the Colossians to “walk in him” (Colossians 2:6). 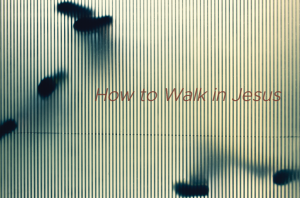 To walk in Jesus is to have a manner of life that is slow, consistent, and active. In essence, it is a life that is consistent with the person and work of Christ. When Christians walk in Jesus they grow into people who have lives that are firm, stable, and effective for the kingdom of God. 1. Keep being taught the truth about Christ. One of the ways that we continue to walk in Jesus is by hearing continual teaching about the facts of Christ. Paul told the Colossians that they were taught the gospel and the mystery of Christ by Epaphras (1:6-7) and they were to look back to the first time they heard the teaching of the gospel, and to presently continue learning and thinking about Christ. This was to be done by listening to the teaching of the apostle Paul who was building off of Epaphrus’ ministry. Practically speaking, one of the most dangerous places to be for a Christian is a place where they aren’t learning anything. Thankfully, at Northpoint Church, there are many opportunities to hear and process good Bible teaching. However, it is possible to be so spoiled by good expository preaching, great Sunday school classes, great small groups, and wonderful adult ministries that we lose our desire to keep on learning things about Jesus Christ. One incredible marker of a Christian walking in Jesus is learning the truth about Jesus. This only happens when we attend church often and listen well to teaching. 2. Submit everything in your life to the lordship of Christ. It is not enough to simply learn the facts about Jesus, but a Christian who walks in him also receives him. John MacArthur once commented that Christians sometimes believe “their behavior has no relationship to their spiritual status—even if they continue wantonly in the grossest kinds of sin and expressions of human depravity … [Christians] have been told that the only criterion for salvation is knowing and believing some basic facts about Christ.” Paul makes it clear that in the same way you received Jesus as King and Lord of your life, you also are to continue to receive him as Lord over your life. Practically speaking, when you came to faith in Jesus Christ, you didn’t just believe the facts about Christ, you became a disciple of Christ. You also became a citizen of his kingdom (Colossians 1:13). A disciple learns and serves his master, whereas a citizen faithfully serves and loves his king. What area in your life doesn’t look like it has come under the lordship of Christ? Could it be the way you use your time? Let that helpful and convicting app “Screen time” be your guide. Could it be the way you spend your money? Is giving to the local church and kingdom work something that’s on your radar? The list could go on, and if you have no idea on where to begin, ask your wife, your children, or just an honest friend (if you have made it this far in the article, stop here and text or call a friend and ask them about what areas they think you have not fully submitted to Christ). 3. Continue being strengthened in Christ. Finally, Paul insists that Christians who walk in Christ grow stronger. He says this in a few ways. First, he speaks of Christians as already firmly rooted in Christ. Secondly, he speaks of the Christian as currently being built up in Christ. Thirdly, he speaks of the Christian as currently being established in the faith. All of these terms are done passively, meaning that God is the one who caused you to be firmly rooted (which he has) in Him, and he is currently building you up into Christ and is establishing you in the faith. Practically speaking, although you are not ultimately responsible for your growth and strengthening in Christ, you do play some role. Your role is to keep being taught the facts of Christ and to keep submitting every area of your life to the lordship of Christ. We ultimately do this by running back to the gospel, which is about the grace of God in Christ for sinners and for his glory. Preach the gospel to yourself. Memorize the gospel by meditating on texts such as (2 Corinthians 5:21; Romans 8:31-34; Isaiah 53:3-6; Romans 3:23-26; 1 Corinthians 15:3-4). Pray the gospel, sing the gospel, review how the gospel has changed you, and study the gospel with great biblical books. We learn more about Christ and we submit our life to that teaching, but God gives the growth and does the strengthening. Resolve yourself to come to church often, find a small group and get plugged in, read a Christian book, and read a book of the Bible slowly. Ask self-reflecting questions, identify the idols of your own heart, and submit them to Christ. Above all, rest in the fact that God is the one who is rooting you in Christ like a tree, he is building you up like a cathedral, and he is establishing you in the faith.